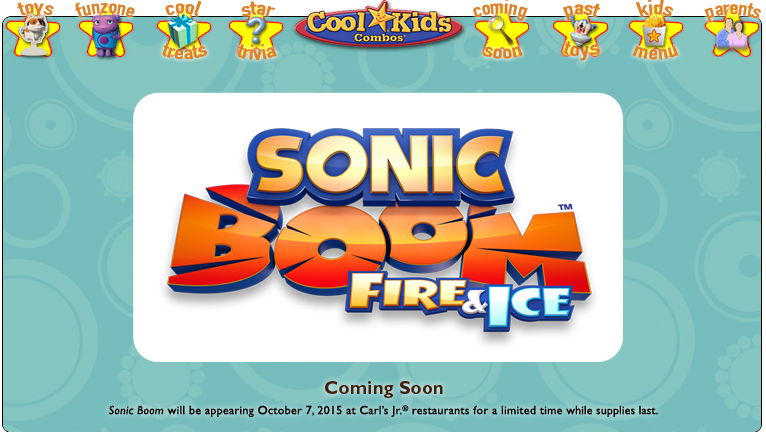 According to a ‘now deleted’ tweet by the CDM company, Sonic Boom Fire & Ice toys are on the way to Carls Jr. and Hardee’s. For those who don’t live in the US, that’s a burger/fast food chain. The exact tweet was as follows. But this was soon deleted suggesting there was an embargo placed on this announcement for reasons we don’t understand. Especially since the exact same announcement is still up and has been up for a rather lengthy period of time on the Carls Cool Kids website which CDM Company apparently handles (see pic above). So anyway, it looks like fast food toys for Sonic Boom Fire & Ice are on the way, this is great news, now if only we could get a side order of a new trailer or a large screenshot of fires to go with that since there has been no news about the game at all since announcement. What do you guys think? Excited about the toys? Going to go to Carls Jr. and Hardee’s just for the toot? Going to get Boom Fire & Ice despite there being no information about it? See that thing below that’s a comment box, you can say stuff like “I WANT TOYS!” or “TOYS!? YOU MEAN ACTION FIGURES!” Let us and your fellow blue believers know, Toys! Burgers! Fires oh my! TOYS! BURGERS! FRIES! OH MY!